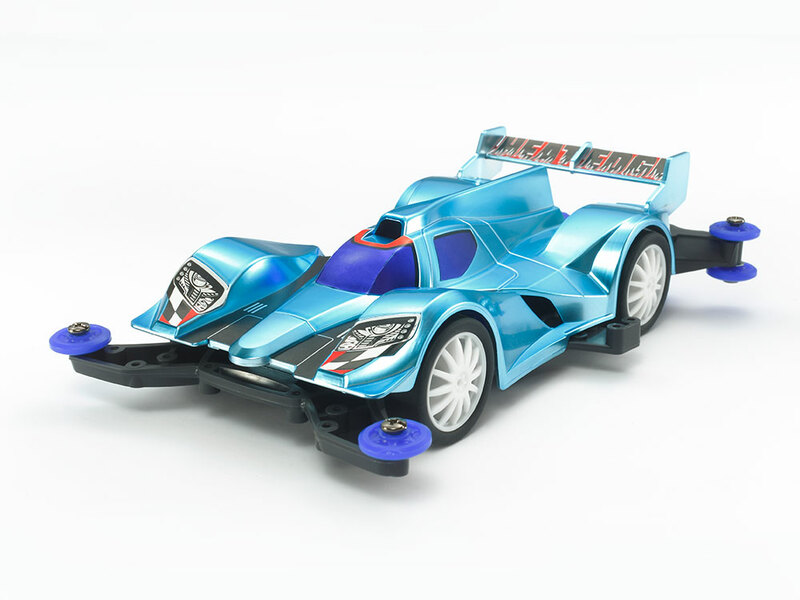 Brushed light blue plated body charmed with finish of alumite finish The front and rear fenders greatly raised, the induction pot at the upper part of the cockpit, the flow restraint plate like the back “Shark fin” behind it, such as the actual car fighting the endurance race Heat edge which imaged prototype racing car. It is a special specification kit finished with a matte light blue plating of the body. I can not express it in painting, texture like alumite is attractive. Different from the original red is a different color attention. MA chassis pursuing drive efficiency The chassis pursued driving efficiency MA. MA stands for Midship AERO (Midship Aero), “MS Chassis” of midship layout with motor mounted in the center of the car body, “AR Chassis” designed specifically with awareness of air current (Aero) running It is this “MA chassis” which put together the excellent features of one in a chassis.Of course, using the racing know-how accumulated so far, a gear ratio of 3.5: 1 is adopted. In addition, the running performance has also been thoroughly refined, including six low friction resin rollers and rear skid bars as standard equipment In addition, adopting an integrated monocoque structure further improves ease of assembly and maintenance , From beginners to veteran racers, from a town race to be held on a small course, to an approved competition of a large special 5 lane circuit, etc. 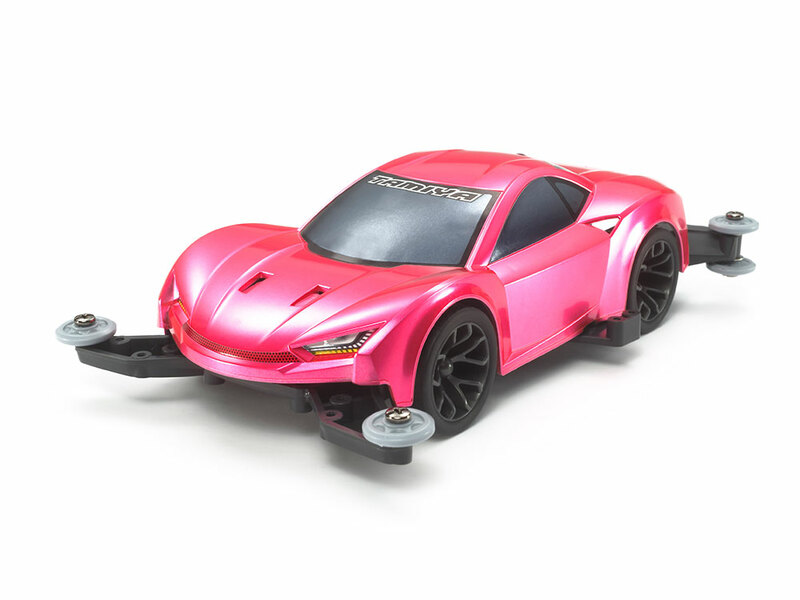 Alumite-like frosted pink plated body is attracting attention Mini 4WD which is a hand of Kota Nezu (representative of znug design) who is active as a car designer is lively. A legendary Japanese sword said to have torn the thunder comes from its name . Reikiri mat pink plating body is a special specification finished with pink plating matte sharp body which imaged flowing sword movement. It can not be reproduced in painting, it is attractive color with full metal feeling reminiscent of alumite. Also, the three-dimensional shape of the wheel and chassis is black color. Bring more vivid body color. Chassis pursuing driving efficiency The chassis adopts MA pursuing drive efficiency. MA stands for Midship AERO (Midship Aero). “MS Chassis” in a midship layout with a double shaft motor mounted in the center of the car body, “AR Chassis” designed specifically with awareness of the air current (Aero) The “MA chassis” that summarizes each excellent feature in one chassis Of course, using the racing know-how accumulated so far, it adopted a gear ratio of 3.5: 1, six low friction In addition, we improved the running performance thoroughly by including resin roller and rear skid bar as standard.In addition, adopting an integrated type monocoque structure, further improvement in ease of assembly and maintainability, such as a veteran racer from a beginner From the town race to be held on a small course, to the official recognized competition of a large special 5 lane circuit, it is possible to deal with a wide range of shakers Is death. Image renewal with brilliant pink gold plating This is a plastic model assembly kit of a four wheel drive racer with high performance running and fun.The machine which imaged the European GT car.A big air outlet is opened in the bonnet, Long nose & short deck body, form equipped with large rear wing has plenty of real car feel.This body is pink gold plated processing special specification. The image is completely renewed from the original coloring based on black. The body which became brilliant pink gold plating finish which can not be expressed by painting is perfectly compatible with the metal style sticker. We installed a low-height tire with a diameter of 26 mm on a silver color fin design wheel, set a gear ratio of 3.5: 1. MA chassis pursuing drive efficiency The chassis adopts MA pursuing drive efficiency. MA stands for Midship AERO (Midship Aero). “MS Chassis” in a midship layout with a double shaft motor mounted in the center of the car body, “AR Chassis” designed specifically with awareness of the air current (Aero) The “MA chassis” that summarizes each excellent feature into one chassis Of course, using the racing expertise accumulated so far, six low friction resin rollers and rear skid bars are standard equipment In addition, by adopting an integrated monocoque structure, ease of assembly and maintainability are improved further, from beginners to veteran racers, and also on a smaller course from dividing Machikado race, until the certified competitions of large-scale special 5-lane circuit, it is the wide range can be chassis. This entry was posted in Future Releases on March 23, 2018 by admin.